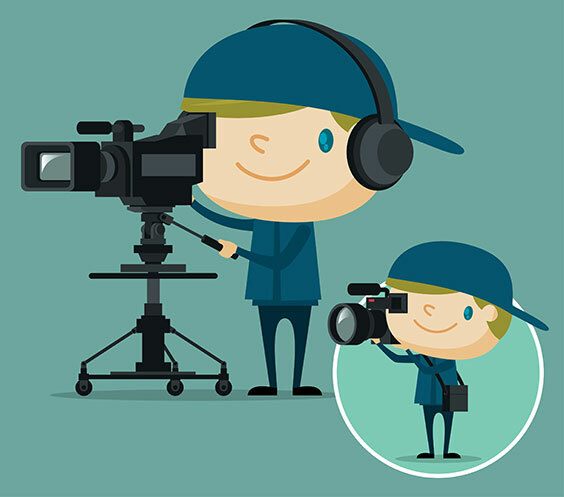 Looking to produce your first promotional video? Don’t panic. It’s easier than you think. And you don’t need to be Steven Spielberg to do a great job. Just follow these simple steps, and you’ll have a professional video you and your company will be proud to share with the world. Most corporate or product videos today run no longer than 2-3 minutes, especially in our instant-gratification-YouTube-and-Twitter-driven-world. Be sure the script has a lively pace, provides lots of selling benefits and is heavy with visual cues. This will make it easy to shoot and even easier to edit. The script will also be your primary tool for estimating production costs. For your first video, you’ll want to connect with a full-service studio that has all the capabilities you’ll need in-house: cameras and operators, lights, a staging area, sound recording capabilities, and editing suites. Ask to see some of the studio’s previous videos — or their “reel” — to get an idea of capabilities and the look and feel of what they can produce. Use what you see as style direction for your video. Click here to view some of the videos produced by Brenner Photo. Decide who is going to narrate the script, whether an on-camera actor or a voiceover who is never seen. Maybe it’s a company spokesperson who looks good, speaks convincingly, and will represent your brand well. Either way, this will be one of the most important decisions you’ll make because of the impression it will leave and the impact it will have on the budget — especially if there is on-location shooting. Also, always choose someone who connects well with your audience. After the shoot, you’ll sit with an editor and your producer to review the first cut of your video scene-for-scene. Here you’ll make more creative choices. What kind of style and tone are you looking for — something serious and thought-provoking or perhaps a lighter touch? Do you prefer longer scenes that last 5 seconds or more, or quick cuts that provide high energy and pace? It’s a good idea to mix it up, so that the video feels interesting and doesn’t fall into repetitious patterns. For instance: Feel free to add still photography to the video, especially for scenes that are expensive to shoot. Consult with your studio on all these issues upfront, since they will no doubt impact how the video is shot. Once the rough cut is produced and approved, then it’s time to smoothen out transitions, polish the audio, and color-correct visuals. Maybe you’re fond of including special effects during scenes, adding a little sizzle to a video, or you’re more a fan of simple cuts and dissolves. Will you need titles on screen to support the script? Music is also vital for creating essential mood, and a lot of material is available royalty-free. Just ask your editor. These extras will add a professional feel to your final cut. That’s pretty much it! Follow these simple steps and you’ll be well on your way to producing a quality video — even your first! Contact Brenner Photo with any video or photography questions.